In 10-inch skillet, heat oil over medium-high heat. Add chicken; cook about 10 minutes, turning once, until brown. Remove chicken from skillet; keep warm. In same skillet, mix garlic, pasta, broth and water. Heat to boiling. Reduce heat; cover and simmer about 8 minutes, stirring occasionally, until most of liquid is absorbed. Stir in remaining ingredients except cheese and olives. Add chicken. Heat to boiling. Reduce heat; cover and simmer about 5 minutes, stirring once, until bell pepper is crisp-tender and pasta is tender and chicken is no longer pink in center. Sprinkle with feta cheese and olives. Complete this meal with warmed purchased focaccia bread and fresh pears or clusters of red grapes. 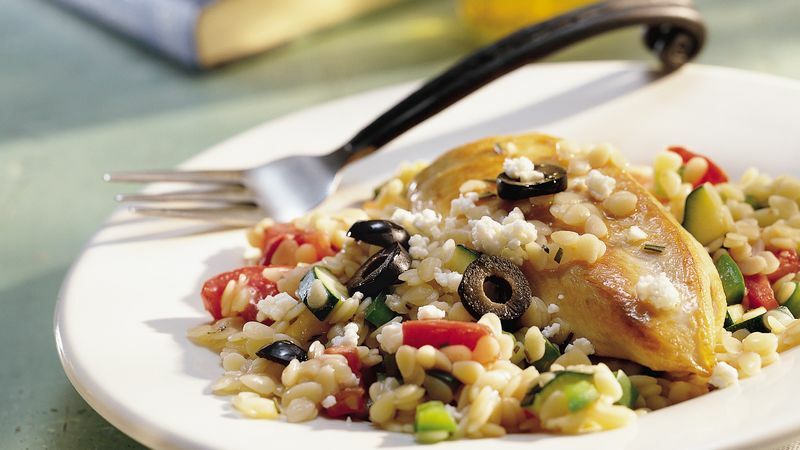 If your family prefers, sprinkle Parmesan cheese over this skillet instead of using feta cheese, and omit the olives.